May consider trading for a RV. Fresh V8 350 Mercruser Inboard and Outdrive. 3 bedrooms, 1.5 bathrooms. Full bath with tub in master suite, 1/2 bath off the kitchen, 2 bedrooms on main floor, 2 cuddie cabins down (1 is a bedroom. 1 changed in 1999 to storage room with 32 gallon water heater, air exchanger and breaker box.) Remodeled in 1999 with new kitchen cabinets, carpet, linoleum, mircrowave over stove, wiring, 3 ceiling fans - (master bedroom, living room and front deck), house lighting thru out, ground fault plugs, heat pump and kohler generator with automatic switching from shore power to generator. 2006 - reconditioned Norcold electric/propane refrigerator and 2 new dual flush marine toilets. Seafire Automatic fire system, built-in automatic battery charger. It has a 4 burner propane stove and oven. 2007 added 27' LCD TV with satelite dish, AM/FM/CD radio with inside and outside speakers, new Magma Montery stainless steel grill, new Fortress adjustable anchor rated for 70' boat. 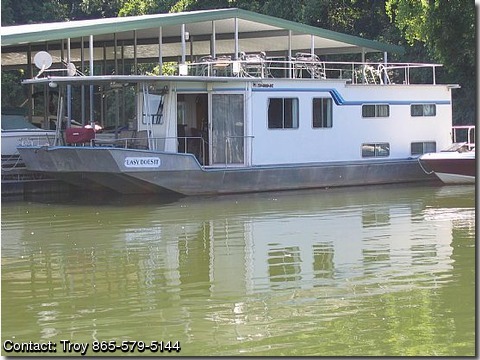 This boat could be perfect for liveaboard, weekend family home or party boat.